John Adams, the HBO series. Abigail Adams is my new role model. Except I'm not sure that I want to work that hard. Or give up mascara. Breaking Away. If I wanted to pretend to be someone else, an Italian exchange student would be top on my list too. Except now I'm thirty something and I don't think anyone would buy it. The Art of Winslow Homer: Makes me want to go run outside and play in the grass. 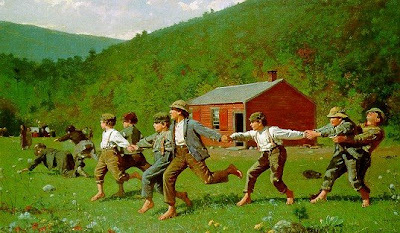 But then I get sweaty and hot and change my mind, and come inside the house and just look at Winslow Homer's artwork instead in the air conditioning. The Outliers, by Malcolm Gladwell. According to Gladwell, you have to spend about 10,000 hours on any given activity to become an expert. It's too late for me, but I'll bet the charges are wondering why violin practice suddenly got about three hours longer. Attack Uno: I just like pushing the card-shooting button. It's thrilling; a bit like Russian Roulette, except with the huge bonus of getting to stay alive. 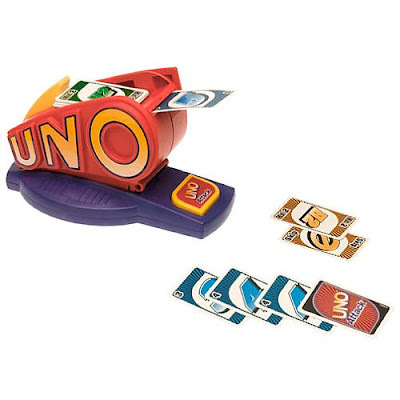 And you get to keep playing Uno for the rest of your life too, cuz you just got yourself 72 new cards. Scrabble: If you play my mom's way, then everyone gets 10 tiles instead of seven. With ten tiles, the finished board looks like the work of geniuses instead of the average intelligence display that I'm so accustomed to producing. I might use 11 tiles next time, and then email a picture of the finished board to my eight grade English teacher. Wouldn't she be suprised. Cinnamon Frosted Mini Wheats. They're just like Frosted Mini Wheats. Except they have cinnamon. Cinnamon Frosted Mini Wheats. With Cinnamon. On the Mini Wheats. 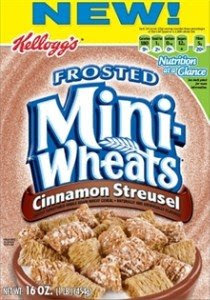 I never thought I'd get so excited about mini wheats, but did I mention that these ones come with cinnamon? Ireland: I should have about $1000 saved for our trip by now. Except I keep stealing from myself. But I usually put back what I steal at some point, since I try to at least loosely keep the commandments. And these Tacos. Well, not just these tacos. Any tacos. I can't get enough. But in all fairness, this is no ephemeral obsession. I think they must have put taco seasoning in the baby formula in the seventies. I'm hooked for life, an inveterate taco chomper. I think you'll love this version too, since it's ready in less than thirty minutes, is a great use of plain old pork chops, and comes with a zippy pineapple slaw. The word "zippy" is from the seventies too, in case you were wondering. What are your current obsessions this summer? Leave a comment and let me know what I should be hooked on next. Money Saving Tips: I buy pork chops 2 for 1 at Albertson's. If large cans of crushed pineapple are cheaper than the itty bitty ones, buy a big can and throw the extra in your baked beans, zuchinni bread, or morning smoothie. Preheat grill for medium hot cooking. In a medium bowl, combine the JUICE of the pineapple, sour cream, chili powder, cumin, lime juice, and cilantro. Season to taste with salt and pepper. Remove 1/4 cup of mixture and rub all over pork chops. Let stand for five minutes. Grill pork chops, about 4-5 minutes per side until only slightly pink in center. Let rest for five minutes, and slice into strips. Meanwhile, combine crushed pineapple with slaw and radishes and reserved sour cream mixture. (Grill tortillas about 1 minute per side and brush with butter and wrap tightly in tinfoil.) Assemble tacos with tortillas, slaw, and pork chops. I'm going to have to get a copy of Outliers, I love Malcolm Gladwell! I've been obsessively reading Columbine by Dave Cullen. It was so compelling, but the language got a bit bad... But such a good book! A must read! I have to rent that John Adams miniseries one of these days. I heard about Outliers earlier this year, and discussion about whether you need 10,000 hours practice to become expert at something (who has that many hours in life anyway?) and hubby won't leave the country so Ireland is out. I do love Homer Winslow. One of the nice things about Calvert 5th grade is their Child's History of Art - Painting. I can't wait to go through it again with Mark! You got me on the inveterate taco chomper. I had to look up the word. I clearly understand what a taco chomper is though. Very interesting combo, but the hubby hates pineapple. I hate cooking 2 different meals at suppertime to please him, so would only be able to try this one when he's off on a fishing trip. Your tacos look so delcious. And who doesn't love tacos? I've been racking my brain for a summer obsession so I could leave you a comment. All I could come up with was nursing my baby and that's not really my obsession so much as it is hers. =) But then I thought of one . . . The Next Food Network Star. I always get hooked on food network after I have a baby and I really like this show but every time I watch this show I think that you could outcook and outstar everyone on it! You need to go on this show! I've talked to several people about it and we are all in agreeance. So you better get going on the process for 2010 or we may just do it for you! YOU are the next food network star! Hi, We read the John Adams book and saw the mini series. We named our daughter after Abigail Adams as we want to to grow up to be a strong woman like her....and at 8 months she definitely has her own personality. Love your blog. ohh I loved the John Adams series! My summer 2009 obsessions are key lime pie and the third season of Mad Men. I can't wait for it to start! My boyfriend's mother shared her amazing key lime pie recipe with me this summer, and I've been furiously squeezing limes ever since--much to boyfriend's pleasure. There's something supremely refreshing about that tart, creamy sweetness that makes me drool. I actually have the John Adams series on my Netflix queue and after your recommendation, it's getting moved to the top of my list! I loved the John Adams series so much--I wonder if there are others like it. One of my current obsessions may be my Topsy Turvy, always fun to grow things, but somehow cooler upside down! Oh, and peanut butter fudge ice cream. Or any other flavor for that matter. I must say those really do look like something I would love. I need to try them soon. 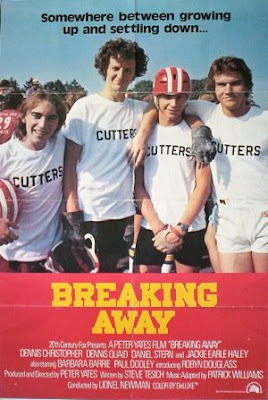 I just love the movie Breaking Away. Your tacos look yummy! I love the tacos they look absolutely delicious, bright, and summery. Wow--those look so good--as so does your list! I am going to have to rent that John Adams. 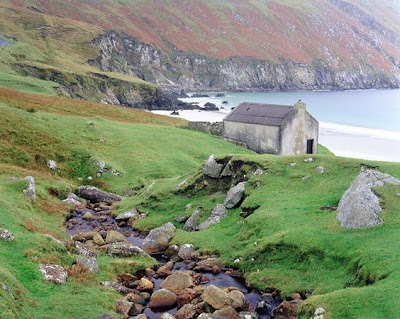 And Oh how I would love to go to Ireland. My Mom and I have a trip "planned" for 2012! Hopefully we get there!